The former Blue Boys Pub stands next to this petrol station. The pub before the service area was built. 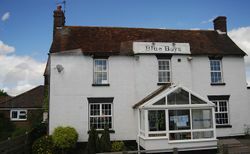 The Blue Boys Inn Pub was based on a 16th century farmhouse, becoming registered as an ale house in 1736. It offered refreshment and repairs at the start of the turnpike. The pub was apparently named after the uniform of King George IV's outriders, who sought assistance at the Inn after the King's coach shed a wheel. In the 1950s coach parking (labelled on maps as a 'coach station') was provided behind the pub. In the late 1980s the coach parking became a motorhome site. After 1994, several plans were made by Aquaries Investments and Margram to build a service station here. One of the plans involved building a restaurant in the pub car park, while another planned a drive thru restaurant in the north-east corner. The sudden need for the services came from the opening of the Tunbridge Wells Bypass to Kipping's Cross, which left very few petrol stations on the A21. It eventually opened in 2006 as Tunbridge Wells services, and included the construction of a new roundabout named Blue Boys. The Blue Boys Cafe in 2011. The pub went on to become Monsoon Spice, and then Blue Boys Cafe. It has since closed and become heavily dilapidated. Several plans have been made to make use of the pub. 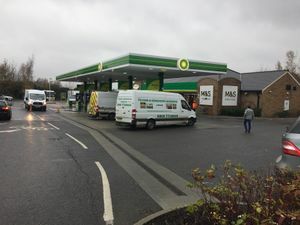 In 2013, there were two plans: one to adapt the pub to become a drive thru, and the other to demolish it and replace it with a two-storey McDonald's drive thru. Part of the building was demolished in April 2014. In May 2014 the pub became a Grade II listed building. In 2018, there was a plan to extend and refurbish the pub, but there is also a plan to replace it with a Burger King drive thru. During late 2018, work started to convert the former pub into the Burger King Drive Thru.